The Stampeder Alumni Association's vision is to establish an alumni association that fosters friendships, camaraderie and networking among our CFL peers. Our mission is to promote the game of football, lead by example and inspire today's youth through positive role models. We also strive to involve former Stampeder players in hands on community service by raising funds for charitable causes. The Alumni Association was founded in the fall of 1975. It now consists of 250 members, of which 150 reside in the Calgary area. Our members annually conduct youth football skill camps for local athletes; play in many fund raising hockey games; participate with the Stampeder players in school basketball games; as well as participate in a number of Southern Alberta Golf Tournaments in support of local charities. 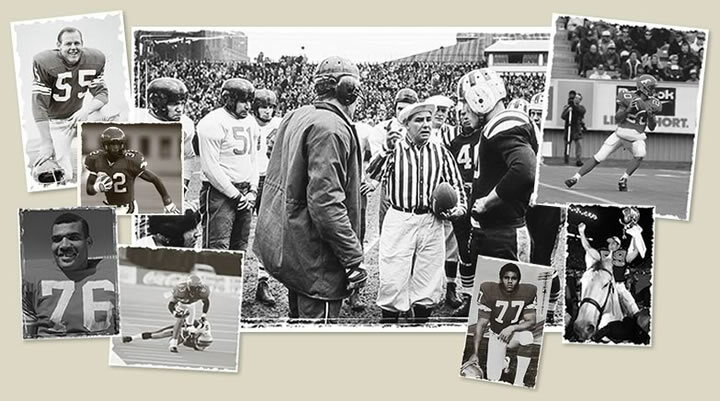 In addition, the Alumni Association provides speakers for numerous sports awards banquets; oversee the Wall of Fame Induction Program at McMahon Stadium; and raise funds through various charity events. Our Alumni Association is reputed to be the largest, most active one in Canada, and we are proud of the contributions we continue to make, both financially, and in the involvement of our Alumni Association members to the community. Calgary has always been a highly desirable city for CFL stars to play in, and to live in. In fact, many CFL Alumni choose to remain in the city to start the next chapter of their lives, in the business world or into retirement. The Stampeder franchise has a rich history, and wants to keep all of our fans connected with those that have created that history, as well as embrace all Stampeder Alumni who currently call Calgary home. Take a look at our rapidly-growing list of Stampeder and CFL alumni, and stay connected to us as we bring you up-to-date news on where they are now and what the Stampeder Alumni Association is doing in the community.